What happens when fashion meets practicality is a new footwear line called MoovBoots. Designed by Meisha Strykowski and Bryony Proctor, these boots will be hit the market on November 1, 2008, just in time for cold weather and rain. If you've always worn practical, though not necessarily "cute" shoes in the winter for the sake of staying warm and dry, that sacrifice is no longer necessary. Inspired by Uggs and Wellingtons, MoovBoots set out to bring femininity to boots that will make you happy when it's cold and rainy out-you'll have an excuse to wear them. LTK: Where did you get the idea for MoovBoots? MB: Well, Meisha and I (Bryony) have done quite a few winter seasons overseas in Europe and in Canada and were always frustrated with the garish or impractical options available. Meisha is really creative and can spend hours just mulling over new ideas and what it would be like to merge products that we love. After one of her many creative hours she came up with the idea of the waterproof 'Ugg' so to speak. We are Australian so we naturally love the Ugg, but it isn't practical in really wet conditions. LTK: When will they be on the market and where are they available? LTK: What makes MoovBoots special? MB: They are a waterproof alternative to the cozy Ugg but with a feminine shape! The MoovBoot is borne out of an idea founded in practicality. Like most fashion fads, they are really trend-based first, and then if they are practical it is a bonus. Our boot is waterproof, easy to clean, form-fitting and stylish. The thing with winter conditions is you often don't care about what you are wearing as long you are comfortable and warm (and I am talking about bone chilling climates). With the MoovBoot you get the best of both worlds. We have worked really hard to make the boot look as feminine as possible. 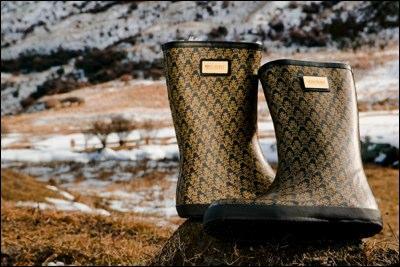 The Wellington boot has been popular for years, but we wanted something that accentuated the beauty of the female shape. LTK: Do you have a favorite pair of MoovBoots? Why are they your favorite? MB: Meisha: I wear the Alice (red ones) the most. They look really vibrant in the backdrop of winter. Bryony: The Rider (beige ones). I am fairly understated when it comes to fashion. The Rider boot is really natural and can go with anything. LTK: What is the price point for these boots? MB: Well, the prices range from $125-180 USD. As this is an Australian product all the prices are in AUD, which means at the moment with the current exchange rate you can get a mid calf for $125 USD and $150 USD for tall. LTK: How many different styles do you offer? MB: We have four designs: The Rider, Lemon Tea, The Alice and Rococo. They can come in either Mid Calf (9.8 inches) or Tall (13 inches). LTK: What do you suggest that customers wear MoovBoots with? MB: Tights and straight leg jeans look adorable. The patterns are so intricate that the usual darker colors of the season go perfectly with the bold, rich hues that we have designed for the first collection. MoovBoots can be worn with just about anything, from jeans to skirts with tights. Their versatility will make you want a pair in every color and pattern so that you can wear them all winter. When the winter weather's not-so-nice, you can still beat the gloom by putting on a pair of boots that fights the cold and wet. If you love Wellingtons and Uggs, testing out a pair of MoovBoots might just give you another boot alternative to love all winter.